If you’d like to know more about the wonders of Medical Mushrooms, Helen will be giving a talk on them on Tuesday 1st May 2018 19:30-20:30. See here for details and get in touch to book. 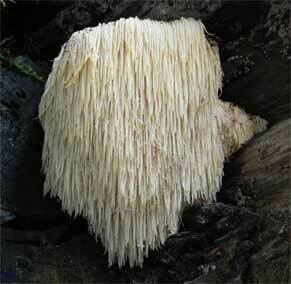 There is mounting interest in the incredible healing properties of Medicinal Mushrooms. They are probably best known for their use in the treatment of cancer, especially in countries such as Japan and China, were extensive clinical trials have confirmed their anti-tumour properties, and where they are now routinely used alongside conventional cancer treatments. In the West, they have also been implicated in “spontaneous regression of tumours”. Beyond the specialized field of oncology, their clinical value spans an impressive and diverse range of medical conditions, thanks to the significant positive influence they have on our immune system. Medicinal Mushrooms like Reishi and Cordyceps have been used for millennia, most notably in Eastern traditions of medicine, where they are greatly prized. For example, Reishi was so highly valued that it was restricted to the court of Chinese Emperors, and was known as the “mushroom of immortality”. Our immune system, having evolved under the constant threat of invading pathogens, is able to detect them due to certain characteristic molecules on the pathogen’s surface, by specific receptors located on some immune cells, such as macrophages. One of the most important classes of molecules for triggering the receptors are Beta-glucan polysaccharides. They are only found on bacteria, viruses, fungi and a few plants (seaweed, oats and barley), and medicinal mushrooms are particularly rich in Beta-glucans. It is thought medicinal mushrooms are so effective at triggering the immune system because the body is effectively being fooled into believing it is being invaded by a harmful pathogen or multiple pathogens. Medicinal mushrooms are special in that they don’t just contain one type of Beta-glucan, thereby triggering one specific receptor, but contain a vast and diverse array of subtlety different Beta-glucans, able to trigger multiple immune cell receptors. Beta-glucans cannot be broken down by our digestive enzymes and pass unchanged to the intestines, where they bind to receptors on macrophage cells, housed within the intestinal wall. The Beta-glucans are absorbed into the macrophage and broken down into smaller components. They are then transported within the macrophage and presented to other immune cell types elsewhere in the body such as in the spleen. This results in multiple components of the immune system being triggered. The action of medicinal mushrooms is much more impressive than just triggering the immune system; their true value lies is in their ability to modulate the immune system, addressing excesses and deficiencies at the same time. Paradoxically they stimulate the immune system, and yet they have also proven to be very effective in calming autoimmune and inflammatory conditions, such as allergies. Orthodox treatments for such conditions would be immunosuppressants. In order to understand the paradox, we first need to grasp how our immune systems work. The human immune system has a dual nature: a “defensive mode”, when it is on the attack and destroying invading pathogens such as bacteria, viruses, or faulty cells; and a “reparative mode”, which involves inflammation and repair. The balance between these two sides of the immune system is largely regulated by T Helper Cells (Th cells). There are two types of Th cells – 1) Cytotoxic Th1 cells, designed to kill infected cells and 2) pro-inflammatory Th2 cells. The answer to medicinal mushrooms health-giving benefits may lie in the way their polysaccharides can shift the ratio of Th1:Th2 cells. There appears to be an increasing prevalence of imbalances and dysregulation of people’s immune systems, resulting in chronic health conditions such as asthma, intolerances and auto-immune conditions. Stress, leading to elevated cortisol levels, lack of sleep and environmental pollutants have been implicated in causing the imbalance between Th cells, resulting in Th2 dominance. This leads to reduced resistance to infection, fatigue, depression, and chronic inflammation. It appears Th2 dominates can become “stuck” and results in chronic inflammation and chronic reoccurring infections, as Th1 cells are significantly suppressed in favour of Th2 cells. The beta-glucans in medicinal mushrooms have been shown to be particularly potent immunomodulators, suppressing the pro-inflammatory Th2 cells and significantly boosting the activity of infection-fighting cytotoxic Th1 cells. Medicinal mushrooms provide a powerful yet safe way to restore a more health-promoting equilibrium between the two aspects of the immune system. 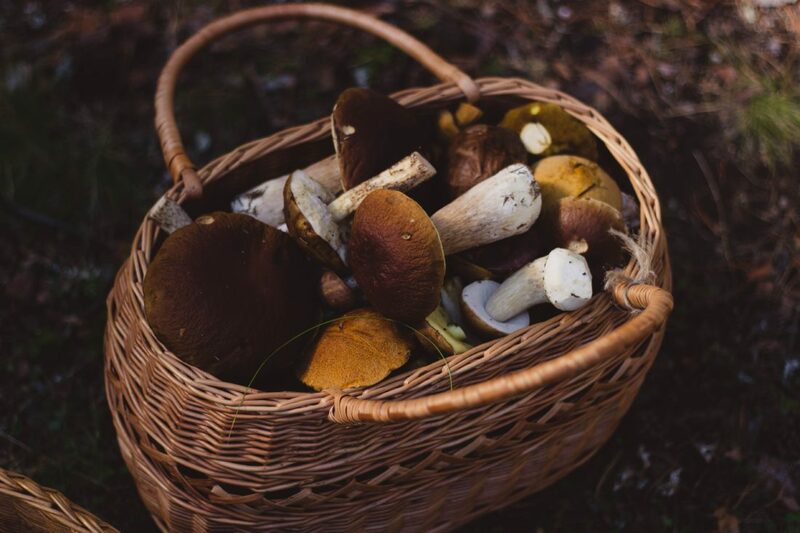 Different Medicinal Mushrooms have traditionally been associated with treating different conditions, although most share the ability to modulate the immune system to different degrees. Reishi is the most esteemed of the medicinal mushrooms and is one of the most highly therapeutic natural remedies ever discovered. It has such a positive immunomodulatory influence over our immune system, by correcting imbalances within the immune system. It strengthens and stimulates the activity of key immune cell types whilst quietening down inflammatory aspects. This makes it especially useful for systemic inflammation and auto-immune conditions. There are different types of Reishi, distinguished by colour, each with their own unique qualities. Red Reishi is strongly anti-inflammatory and antioxidant and is protective of the liver. It reduces the effects of stress on the body, helping with fatigue, insomnia and anxiety and positively influences our cognitive, cardiovascular and nervous systems. Its Chinese name translates as “spirit plant” and this is reflected in its scientific name ‘lucidum’. It brings you into a state of ‘centredness’ and emotional balance promoting a sense of well-being. 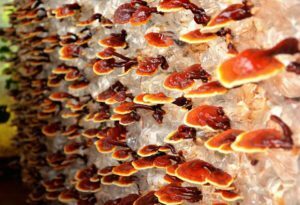 Caution: Reishi should not be used with anti-coagulant medication unless under medical supervision. 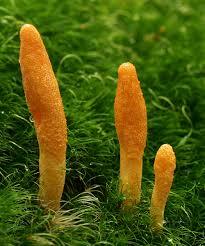 Cordyceps is unique in growing parasitically on an insect rather than on a plant or tree. It is important to source commercially cultivated Cordyceps from a reputable supplier because in the wild it is rare and threatened, and over-harvesting is damaging its natural habitat in Tibet and Bhutan. Furthermore, there is no clinical or chemical difference between the commercially cultivated or wild sourced specimens. It has been used in Tibetan, Chinese and Japanese medicine for impotence and infertility, for treating acute and chronic illnesses, especially of the kidney, heart or lungs, and it appears to have a particular affinity for the lungs, and is useful for conditions like allergic asthma. It enhances aerobic capacity and improves oxygen uptake making it particularly favoured amongst athletes. The beautiful and pleasant-tasting Lion’s Mane has been described as ‘Nature’s Nutrient for the Neurons’ and is of particular value for neurodegenerative disorders such as Multiple Sclerosis, Dementia and Alzheimer’s by suppressing immune-mediated inflammation of the nerve cells. It improves memory in general and supports cognitive function. Another traditional use of Lion’s Mane has been in treating gastric ulcers and gastritis, possibly on account of its strong antibacterial action. 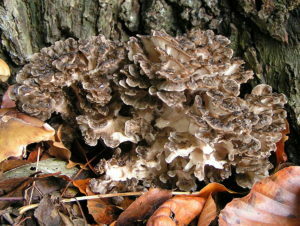 Maitake is particularly useful for addressing metabolic disorders and helping with weight management. It increases metabolic activity and reduces the conversion of sugars into adipose (fat) stores and reduces triglyceride levels. Various studies have demonstrated its ability to control blood sugars levels in patients with type II diabetes. Benefits from Medicinal Mushrooms are frequently noticed after 2-3 weeks although longer treatment protocols are recommended to tackle medical conditions. Please note: It is advisable to consult a qualified practitioner before taking any kind of herbal supplement, including Medicinal Mushrooms. Click here, contact the Soul Happy facebook page, or call 07807 273525 to book a consultation with Helen and discuss the benefits Medicinal Mushrooms and other Herbal Medicines could have for your health and wellbeing.